Refugee Social Integration in Japan, Korea, and the United States. This Symposium is a part of an ongoing Korea-US-Japan Good Practice Exchange on Refugee Social Integration. The project is funded by the Center for Global Partnership (CGP) of the Japan Foundation. There are more refugees in Asia than in any other region of the world, and yet very few countries in the region are providing asylum or taking responsibility for their protection. In this context, leadership by Japan and Korea are critical. Both countries have signed the Refugee Convention and do provide asylum. Japan was the first country in Asia to develop a refugee resettlement program brining Burmese refugees from camps in Thailand to live in Japan. What began as a pilot has become an ongoing program. Korea is now planning to begin a new resettlement program to Korea, now only the second country in Asia to do so. 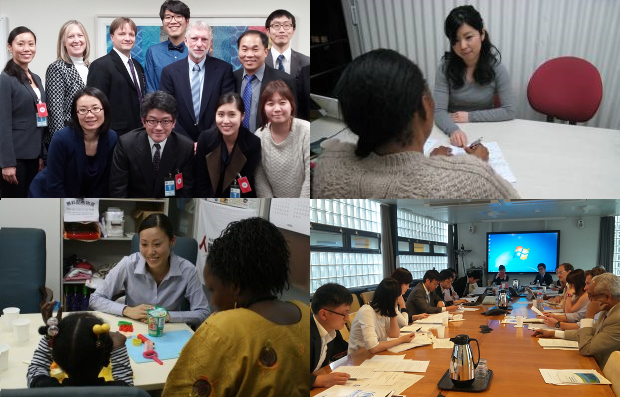 This year, with the ongoing support of CGP, the Japan Association for Refugees ("JAR") in collaboration with partners in the US and Korea, is moving forward to further deepen the exchange, focusing on identifying good practice and encouraging the development of programs in Japan and Korea for refugee social integration that will serve as a model for the rest of the Asian region. The goal is to develop stronger refugee protection and assistance programs that will contribute to international responsibility sharing and to facilitate deeper collaboration among stakeholders in the U.S., Korea and Japan. This Symposium will look at the recent international response to the humanitarian emergency in Syria, for lessons learned about the importance of responsibility sharing, and to share experiences about Syrian refugees and asylum-seekers in each country. It will then look more deeply at a specific issue, "access to employment" and the social context of seeking employment and integrating into the employment context of each country. All those interested in this conversation are welcome with a larger view to promote the development of a more humane and multi-cultural society that welcomes and supports integration. The registration is closed. Please come to the venue directly.